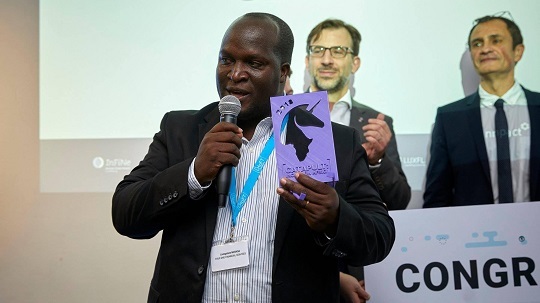 LUXEMBOURG CITY – Four One Financial Services, also known as Mazima Retirement Plan, Uganda’s informal pension scheme emerged top of a competition by Catapult: Inclusion Africa, a Bootcamp on financial inclusion organized by the Luxembourg House of Financial Technology (LHoFT) Foundation. A total of 14 fintech startups were selected from 128 applicants and Four One Financial Services emerged top of the competition after its pioneer innovation in social security for Uganda’s citizens impressed the expert jury at a final pitch session and networking event. Mr. Livingstone Mukasa, the CEO and co-founder of Four One Financial Services Limited, received the cash prize of US dollars 5000. “From managing other people’s businesses to starting and managing my own I have learned many lessons that am inspired to share. Having been born in poverty, I was lucky to escape through a combination of getting a decent education and starting a business. I motivated by the need to help as many as possible,” he is quoted as saying. “I am a passionate believer in business as the ministry. Before starting Four One Financial Services I ran (and still own) two other organisations: Clean Consult Limited a cleaning company employing more than 40 people in Kampala, and Living Business Education a micro business training, coaching and mentoring organisation that has reached more than 20,000 people creating thousands of jobs and enterprises majorly in Uganda,” he adds. Building on local expertise and aligned with the sustainability goals of Luxembourg’s finance centre, Catapult: Inclusion Africa targets fintech companies that aim to help increase financial inclusion in Africa. In addition, the Bootcamp also aims to build bridges for business between Africa and Europe.